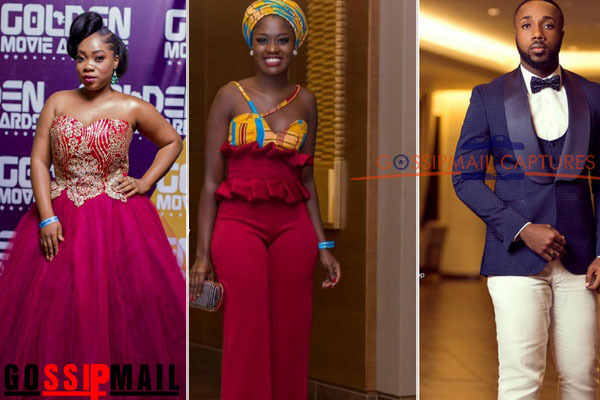 Your favorite Ghanaian and Nollywood celebrities a.k.a “Slay mamas and kings” stormed the Mövenpick Ambassador Hotel, Accra in their various looks for the 2017 Golden Movie Awards. This is the show’s 3rd year in existence, attracting key industry players from both Ghana and Nigerian to celebrate the best in the film industry. The guest included Lydia Forson, Chris Okagube, Beverly Naya, Zynell Zuh, Benedicta Gafah, Fela Makafui, AY Comedian, Nadia Buari, Nikki Sammonas, Moesha Boudong, James Gardiner, Ramsey Nouah, OC Ukeje, Uti Nwachukwu and a list of other celebrity names. Red Carpet was hosted by top model Victoria Micheals and actor Uti Nwachukwu whiles the main show was hosted by Osas Ighodaro Ajibade from Nigeria. Take a look at all the glamorous looks from your favorite celebrities at the awards.